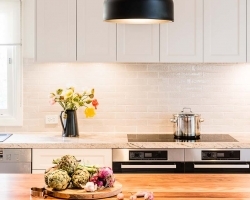 When people desire a Hamptons style kitchen, the most common colour choice is white. It is a refreshing diversion to see a different colour. Grey is used here in combination with white to provide contrast, interest and depth. 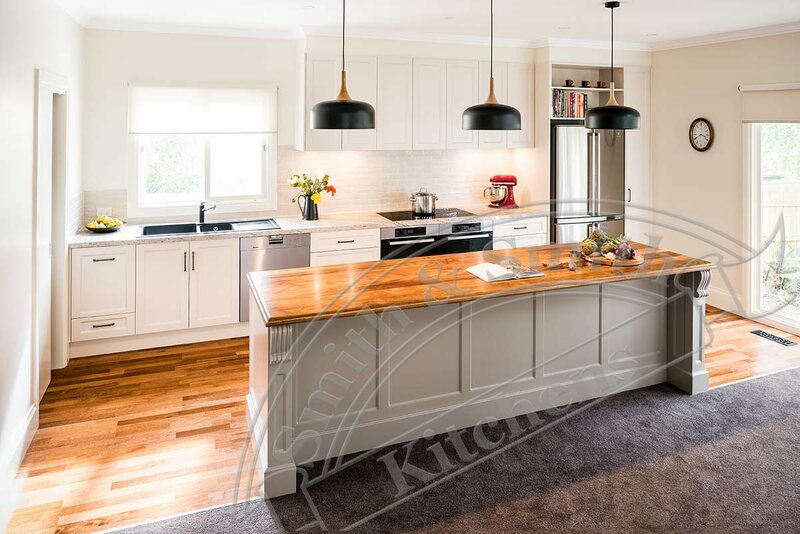 This beautiful white and grey kitchen with a combination of stone and timber benchtops has a homely, yet refined feel about it. The Hamptons style is coastal, relaxed and has a handcrafted look. It invites congregation around the kitchen. 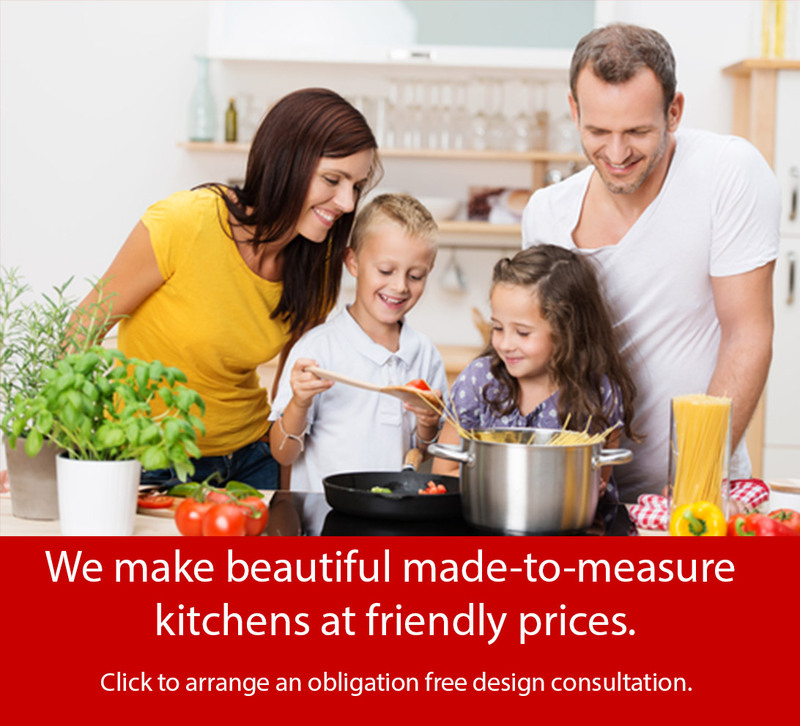 is just as much about creating spaces to converse as for functional food prep. It encourages culinary activity without being tucked out of the way. 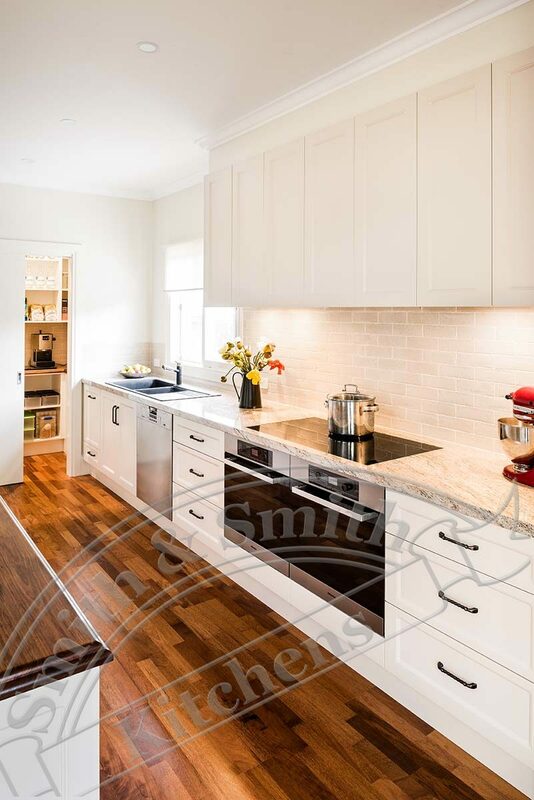 A Smith & Smith ‘stepped inner’ door profile provides a touch of that traditional feel without being too fussy. 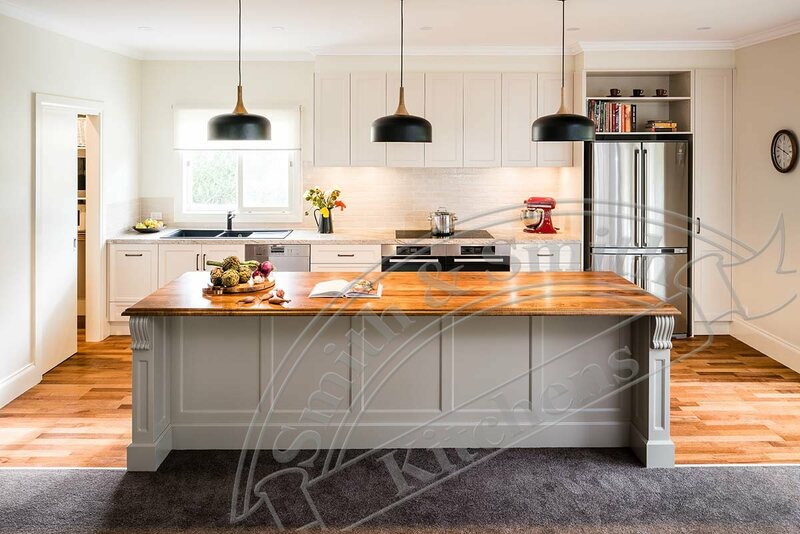 The combination of Colonial White granite and oiled Tasmanian Blackwood take on a variety of roles within this kitchen that’s been cleverly designed to fit with the owner’s lifestyle. 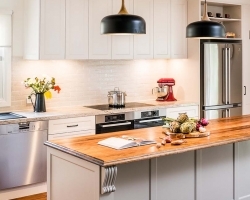 Granite is superbly functional around cooktops and as long as it has been sealed, provides great stain resistance. 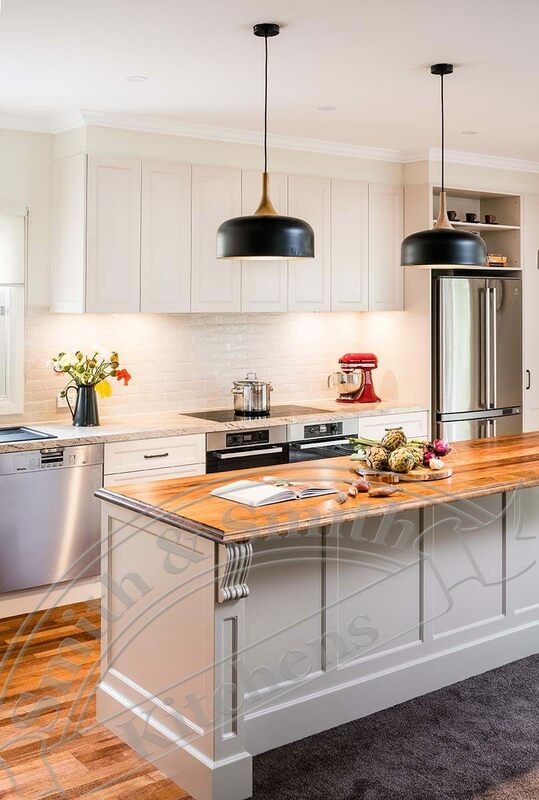 Cooks insist on having granite or marble somewhere in the kitchen because it provides the ultimate cold surface for rolling out pastry or biscuit dough without it becoming too warm. 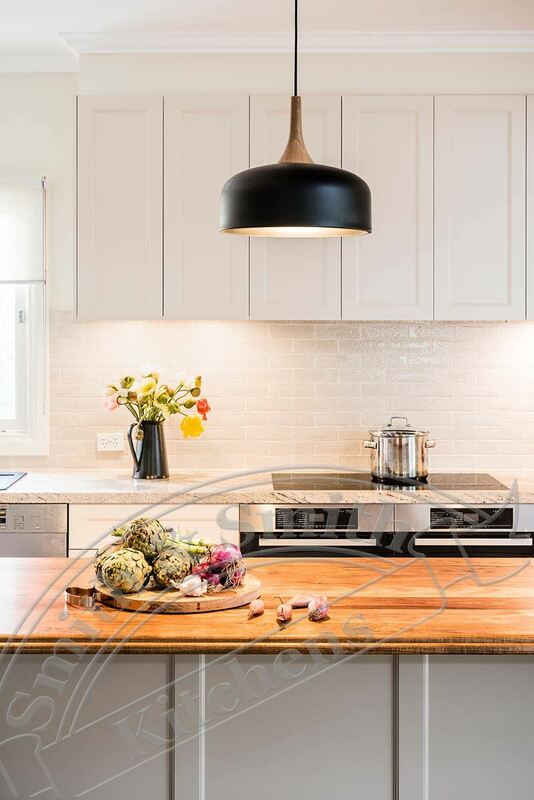 Visual warmth is brought into the kitchen with a decorative oiled timber benchtop with a double bullnosed edge. The placement of the timber bench on the grey island bench makes the colour and grain of the the timber pop. 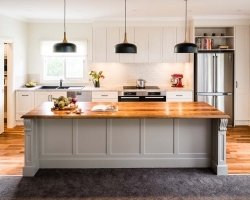 Timber is inviting because it is tactile, warm to the touch and kind to the enevitable knocks and scrapes of crockery – it causes less breaks than harder surfaces. 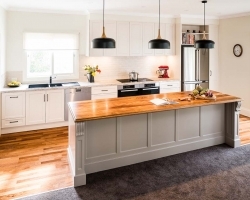 Butler’s pantries are becoming more common in homes as people realise how handy they are for storing a multitude of small appliances, large platters and bulk items. 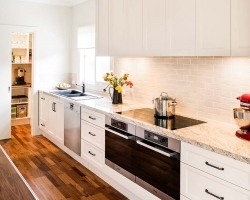 This kitchen is no exception and makes great use of otherwise awkward space by turning it into a very functional butler’s pantry.